Diegomar Markwell pitched in the Blue Jays organization from 1997 to 2003, going 37-41 with a 4.95 ERA. He then moved to the Netherlands, where he has become one of that country's best pitchers, going 82-18 with an ERA under two over the past nine seasons. In 2013 he went 6-2 with a 1.19 ERA in ten starts for Neptunus. He kindly answered my questions about baseball cards. "I got some from when I was on The 40man roster of the Blue Jays in 2003 but besides that I don't collect them. I just like the ones I haven't seen at all. I might ask people to give me one and that's about it." Kevin Gallaher pitched eight seasons of professional baseball in the Astros, Tigers, Orioles and Brewers organizations. In 214 games he went 42-56 with a 4.85 ERA. Now an assistant coach for the Winter Park Diamond Dawgs in the Florida Collegiate Summer League, he kindly answered my questions about baseball cards. "I collected many thousands of cards over the years. My favorite baseball card was the one with three men were on 40 men prospects roster, Single A Billy Wagner, Double AA Kevin Gallaher, Triple AAA Phil Nevin." Thanks! I couldn't find a picture online of the card he refers to, from, 1994 Classic Tri-Stars, but here is the one of him from the base set that year. Outfielder-second baseman Bobby Scales played fourteen seasons of professional baseball, including two years in the major leagues with the Cubs and two years in Japan for Hiroshima and Orix. Now the Director of Player Development for the Angels, he kindly answered my questions about baseball cards. "Honestly, I never collected cards or sought autographs. The only cards I had were ones that were given to me. After I looked at them, they ended up in a shoebox under my bed and that was that. The only memorabilia that I had was a Dominique Wilkins autograph that my father got for me on a napkin in the Atlanta airport. My dad also got a Charles Barkley autograph on a brown paper bag because they were walking out of a restaurant at the same time when the Sixers were in town. I have to admit having a baseball card is pretty cool. I guess my favorites would be the ones from my two years in Japan. Don't have any idea what they say but oh well! " I have one card of Pedro Alvarez, from 2012 Topps. Playing career: Third baseman Pedro Alvarez was the Pirates #1 draft choice in 2008, made his major league two years later, and two years after that had a breakout season, hitting 30 home runs. Where he is now: He continued to hit for power in 2013. Though he led the league with 186 strikeouts, he also led the league with 36 home runs. My memories: I was aware of him as part of the Pirates young nucleus of talent but had not realized he led the league in home runs, especially with such a low number. Google Autocomplete results: He is seventh when you type Ped, between Pedialyte, an electrolyte drink for children, and Pedro Moreno, an actor. Another prominent Pedro Alvarez is an engineering professor at Rice University. Coming up next: The next profile will be Burke Badenhop. I wanted to post a few more cards from my trade with View from the Skybox. Partly because he did a video break of the cards I sent to him, which was really flattering. (There was even a contest at the end of the last video that I don't think anyone entered). I'm too shy to do the same but I figured I could at least give this awesome trade a second post. 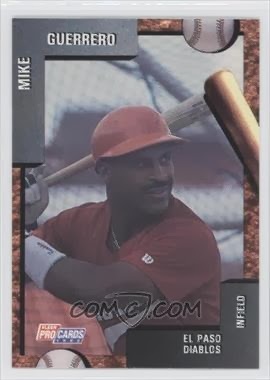 Also I wanted to highlight the photography of what I think is a really underrated set - 2009 Upper Deck. You never see these cards on the blogs, but I think the squre gold border is really classy looking, and there are some beautiful photos on these cards. Take a look. The son of former major leaguer Steve Dillard, pitcher Tim Dillard appeared in 73 games for the Brewers from 2008 to 2012, going 1-4 with a 4.70 ERA. He split the 2013 season between Lancaster and Nashville, going 4-2 with a 3.83 ERA. "My dad, 2 older brothers, and myself had huge collection of baseball cards, sets, cereal box cards, you name it. My dad played in the big leagues for several years before I was born. And by the time I came along he began coaching in the minor leagues. My dad always sported a mustache on his 8 or 10 MLB cards, but for years when I was little, I got him confused with my cards of Mike Schmidt. When I was 10 my dad was coaching A ball for the Astros in Quad City, Iowa. Billy Wagner was coming through the system and I shined his shoes. He made the Midwest League all-star team. After the break he brought me back an all-star team card set. 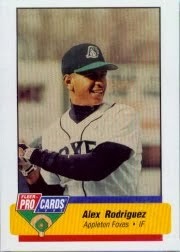 2 or 3 years later I was scanning that set and found an Appleton Fox shortstop named Alex Rodriguez. At the time it was a rare card. And in those days I couldn't even find a value on it. I scrapped my money together and bought the biggest hard plastic holder with the screws in the corners to keep it safe. When I was 16, my family's house accidentally caught fire, and subsequently burned to the ground. With all our huge collections inside. My dad lost his 3 Nolan Ryan rookie cards that he'd had for decades. My oldest brother lost his Ken Griffey Jr. Upper Deck Rookie. My brother had several Catfish Hunter signed cards. I had every Astros from '89-'94 signed cards lost. But as I sifted through the rubble over the first few weeks of my junior year in high school I found it. I found my Alex Rodriguez card! Unfortunately it was still in the plastic holder and it had melted into a giant warped plastic ball! After the wind was knocked out of us like that, none of us ever collected cards again. Over the last 15 years many baseball people all over the country have generously given me cards of my dad. It's a heart warming feeling every time." Thanks! Here is a card of him from my collection, from 2012 Topps. Outfielder Dan Briggs played seven years in the major leagues for the Angels, Indians, Padres, Expos and Cubs. His best season was 1979, when he hit 8 home runs in 227 at bats for the Padres. Now the owner of the Big League Baseball School in Worthington, Ohio, he kindly answered my questions about baseball cards. "Don't really have a favorite card. I do have a picture of myself with teammate Nolan Ryan; Nolan, because of his tremendous work ethic and down to earth personality is a former teammate I most respect. No, I do not collect cards." Thanks! Here is a card of him from my collection, from 1979 Topps. Second baseman John Finn played eleven seasons in the minor leagues in the Brewers, Pirates, Cubs, White Sox and Phillies organizations. In 978 games he hit .271 with 20 HR, 328 RBI and 198 stolen bases. Now the owner of Fintastic 360 baseball instruction in Phoenix, he kindly answered my questions about baseball cards. "I forgot what brand card but on my card it had Mike Guerrero's name and on Mike Guerrero's card it had my name - funny experience. My favorite card was my top prospect card - it had me jumping over a guy turning a double play. Yes I used to collect." Thanks! I found a picture of Guerrero's card with Finn's picture, but couldn't find a picture of Finn's card from that set which would have a photo of Guerrero. Outfielder Rob Ducey played thirteen seasons in the major leagues for six different teams. In 703 games he hit .242 with 31 HR and 146 RBI. Now a minor league hitting coach for the Arizona Diamondbacks, he kindly answered my questions about baseball cards. "I think the card I most like is the one with Ernie Whitt, myself and Fred McGriff on it. We hit 10 home runs against Baltimore in September of 1987 to break the Major League record. It was also my first of very few home runs in the big leagues. I do not collect cards." Thanks! I don't have that card, but here is one from my collection, from 1991 Donruss. I got almost a thousand cards in a great, epic trade with View from the Skybox. I don't buy current retail so the way I get almost all of my modern cards is through trades like these - almost all of the cards were from the past five years. I finally got my first 2013 Topps base cards, including these great card of Brett Gardner, one of the very few offensive threats left on the Yankees. Another 2013 set that was new to me was Panini Prizm, which he sent a bunch of. I think these cards look great - they're much shinier than they look in this picture. Speaking of shiny, here's a super-shiny A-Rod! This may have been my favorite card of the bunch. I take the subway when I go to Yankee Stadium. You can't see it from the street but it would be past the right side of the photo. Therefore, I never approach from this side on 161st street. I will have to check out this cool baseball artwork next year. Frank Laviano pitched in the Yankees organization from 1990 to 1992. His best season was 1991, when he went 5-3 with a 4.65 ERA for Oneonta. Now a Senior Vice President at Morgan Stanley, he kindly answered my questions about baseball cards. I played with Mariano Rivera, Jorge Posada, all those guys. It was neat to see Mariano’s first and last game. I liked all three cards that I had. The first year card was nice. In the Greensboro set, there was a picture of Trey Hillman (now the Dodgers bench coach) turning a double play. There was Shane Spencer, Mike Figga (played with the Orioles), also Tom Wilson (played with the Blue Jays). I did collect. I stopped a few years ago. I have every Topps set from 1968 on, as well as some cards from late 50s and early 60s. I stopped around 2008 or 2009. I have one card of Alexis Aranzemendi, from 1993 Front Row. Playing career: Third baseman Alexis Aranzamendi played three seasons in the Marlins organization. In 101 games he hit .258 with 5 HR and 54 RBI. Where he is now: A consultant at Puerto Rico Sports Management & Consulting in Arecibo. Google Autocomplete results: He is the only result when you type Alexis Aranz. There do not appear to be any other prominent Alexis Aranzamendis. I have one card of Matt Beaumont, from 1996 Best. Playing career: Matt Beaumont pitched in the Angels and White Sox organizations from 1994 to 2001. In 174 games he went 46-58 with a 4.70 ERA. Where he is now: Sales Representative at Stryker Endoscopy. Google Autocomplete results: He is first when you type Matt Beau, ahead of Matt Beauchamp, a political blogger. The first entry when you google Matt Beaumont is not the ballplayer but a writer. I have one card of Steve Anderson, from 1992 Classic Best Greensboro Hornets. Playing career: Second baseman Steve Anderson played in the Yankees organization in 1991 and 1992, and also played some independent ball. In 248 minor league games he hit .288 with 17 HR and 131 RBI. Where he is now: Anyone know where Steve Anderson is now? Google Autocomplete results: He is fourth when you type Steve And, between Steve and Andreas, a restaurant in New Jersey, and Steve and Larson, wrestling bloggers. There are no entries for the ballplayer on the first page of results; the first entry is for an insurance industry writer. Coming up next: The next profile will be Matt Beaumont. Jason Bergmann pitched for the Washington Nationals from 2005 to 2010, winning 12 games and striking out 299. In 2013 he pitched in the Royals organization and for Sugar Land of the Atlantic League. He kindly shared this baseball card story. "As a pitcher I actually have a card with me batting...the kicker is I'm a terrible hitter. I'm actually facing Kershaw in the AB too. It was my only daytime start in LA. You can tell because of the yellow seats in background." I have one card of Chris Allison, from 1996 Best. Playing career: Second baseman Chris Allison played in the Red Sox organization from 1994 to 1997. In 352 games he hit .284 with 2 HR, 113 RBI and 74 SB. Where he is now: Anyone know where Chris Allison is now? Google Autocomplete results: He is fourth when you type Chris Alli, between Chris Allingham, a September 11 victim, and Chris Allieri Univision, a digital director. There is no mention of the ballplayer on the first page of results; the first result is for the founder of Sonic360 Records. The Greensboro Hornets were a Yankees minor league team in 1992. Two members of the "Core Four" were on that team - Andy Pettitte and Jorge Posada. So was another guy who would win a world series ring for the Yankees, Shane Spencer. A left-handed pitcher named Andy wore #46 for the Hornets, but it wasn't Pettitte, but teammate Andy Croghan. I used to read about guys like Andy Croghan and Lewellyn Hill in Yankees Magazine when i was young - they used to have a great minor league section with player profiles for each affiliate each month. I was a subscriber from 1986 to the early-00's when the content sloughed off as the internet made a lot of it obsolete. There is a lot of great action photography in the set, but the best action photo of all may actually be of manager Trey Hillman, apparently turning a double play. Yesterday I posted the checklist for this set, and it listed card #29 as Greg Spatt (the trainer). However, there was no card of Spatt but instead this generic logo card after card #28. It appears the Spatt card was never produced. A 1992 Greensboro Hornets team set. This will get it's own post. Two members of the Core 4, and Shane Spencer, the Home Run Dispenser! There was a near-complete set of 1992 Front Row Draft Picks. I have a ton of near-complete sets of '91, but needed most of '92. Lots of interesting players like John Dillinger, who played eleven years of minor league ball and recently became one the very few ex-professional ballplayers to come out of the closet. My first base card from 2013? Nope! This one is from the Update set. Nice Mariano Rivera lurker. Tons of cool Derek Jeter cards, like this one with Jason Giambi lurking in the background. There were a ton of cool Giambino cards as well. Some great Don Mattingly cards too. There were even some really vintage cards from the mid-1970s. I'm pretty sure I have this card already so it is up for trade. Two Derek Jeter rookie cards I did not have featuring him in the uniform of Kalamazoo Central High School. There were a bunch of want-list set fillers too, like this one of Mike Kingery and a wiffle-ball bat. Lots of minor league cards from sets like Classic, CMC, ProCards and Line Drive. Check it out, a Puig card! Those are worth a lot, right? I have the correct version of this card but now I have the error version with no TM logo under the eagle's wing! Completed set - 1980 Topps! Now I have the complete run from 1978-1995. There were a lot of early-80s Yankee Fleer Star Stickers which were a lot of fun. This smily Dave Winfield may be my favorite of the bunch. I have eleven cards of Mark Belanger. This one is from 1981 Fleer. Playing career: Mark Belanger is considered one of the greatest fielding shortstops of all time. He was Baltimore’s regular shortstop from 1968 to 1980, replacing Hall-of-Famer Luis Aparacio and replaced by Hall-of-Famer Cal Ripken. He was an eight-time Gold Glove winner and was a regular in the lineup despite being a very weak hitter. In only three of the 13 seasons he was Baltimore’s regular shortstop did he hit as high as .230, and he had only 389 RBI in over 2000 major league games. Post-playing career: After his career he had a leadership role in the MLB Players Association, supporting Donald Fehr. A notorious chain-smoker, he died of lung cancer in 1998. My memories: He is from before my time but I have often heard of him as the ultimate “good-field, no-hit” shortstop. Google Autocomplete results: He is second when you type Mark Be, between Mark Begich, a Democratic Senator from Alaska, and Mark Bell, a powerlifter. Another prominent Mark Belanger is Chief Risk Officer at Deutsche Leasing USA. I have one card of Brandon Belanger, from 2001 Grandstand. Playing career: Brandon Belanger pitched in the Padres organization in 2000 and 2001. In 64 games he went 4-4 with 14 saves and a 5.71 ERA. He quit after the 2001 season because he felt he had accomplished all of his baseball goals and wanted to go back to school. Where he is now: National Sales Director for Permix Therapeutics. Google Autocomplete results: He is first when you type Brandon Bela, ahead of Brandon Belanger Plymouth, a criminal in England. Coming up next: The next profile will be Mark Belanger. I have two cards of Kevin Beirne. This one is from 1999 Topps Traded. Playing career: Kevin Beirne pitched for the White Sox, Blue Jays and Dodgers from 2000 to 2002. In 46 games he went 3-3 with a 6.09 ERA. Where he is now: A youth pitching coach in Texas. My memories: I wrote to him earlier this year. He said he collected as a kid but no longer had the cards, and had no favorites or stories. Google Autocomplete results: He is seventh when you type Kevin Bei, between Kevin Beiner North Shore, referring to the Chief of Staff at the Long Island hospital, and Kevin Bein Climber, a famous mountain climber. Another prominent Kevin Beirne is an auctioneer in Ireland. Coming up next: The next profile will be Brandon Belanger.